Sudoku Puzzles to Print has Free Printable Sudoku Puzzles. Sudoku Puzzles to Print is a website dedicated to bringing you free Sudoku. 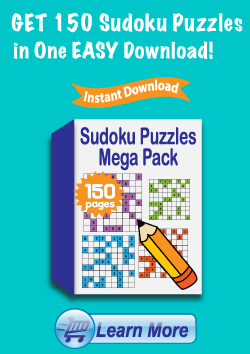 The site is filled with free printable Sudoku puzzles organized by skill level. The skill levels are very easy, easy, intermediate, difficult, and very hard. There is also a section with Sudoku puzzles for kids. All of the puzzles are print ready so that you can start playing instantaneously. A Sudoku printable makes a great activity for teachers, students, parents, and kids. Brain teasers improve memory and get the mind working. Logic puzzles such as Sudoku keep your critical thinking skills fresh. Sudoku Puzzles to Print has a free online section of games incase you do not have access to a printer. Sudoku is a logic puzzle. Logic puzzles require that you apply specific solving techniques in order to finish successfully. A Sudoku puzzle game begins with a board that is sparingly filled with numbers. These numbers typically range from one to nine. The size of a Sudoku board can vary with the most common size being 9x9. Most of the Sudoku puzzles to print are 9x9. You start to play by filling in numbers. The numbers one through nine can only appear once horizontally, vertically, and in sections of nine. The object is to solve the entire Sudoku puzzle correctly. It is important to remember that numbers can not repeat. Check your Sudoku answers once you have completed the game to make sure you solved the puzzle correctly. There are a number of Sudoku strategies. A solid Sudoku strategy will help you solve a puzzle successfully in the fastest amount of time possible. My favorite Sudoku strategy is very basic and easy to learn. You start by analyzing the Sudoku board. Look for the areas on the board where the most amount of numbers are given to you. These are the columns or boxes you should begin working with. As you start to fill in the board it will get easier as one solved block will help you finish the rest of the puzzle. This is a simple strategy also used in solving crossword puzzles. Another Sudoku trick would be to use a pencil when solving. Write in all possible numbers in each of the empty blocks. Then erase them 1 by 1 using the process of elimination. This strategy takes longer but will produce a higher rate of correct blocks. Use these Sudoku solving techniques or come up with your own. Sudoku puzzle boards have different sizes. A 9x9 Sudoku grid is probably the most popular followed by the 3x3 puzzle board. I have heard of unusual Sudoku boards as well. There have been 4x4, 7x7, 25x25, 12x12, and 16x16 Sudoku puzzles. Kids and people just starting out will appreciate the 3x3 Sudoku grid. It is the easiest to solve and keeps the game streamlined. Once you have enough knowledge on how to do Sudoku you may want to upgrade to the 9x9 puzzle board. The 9x9 printable Sudoku puzzles are the size mainly used on this website. 12x12, 16x16, and 25x25 are good practice for competitive Sudoku players. They should really enhance your problem solving skills. The object of the game stays the same on all puzzle boards. Sudoku puzzles to print are better than playing online. A Sudoku worksheet is a great way to learn the game. You can erase mistakes, play anywhere, and get help from your friends whereas online Sudoku can have time limits, usage restrictions, and usability issues. I have made the all the Sudoku puzzles print ready. You have the choice to download and print the PDF or to print the worksheet directly from your browser. Teachers will appreciate the free worksheets as they easily be used in class. A Sudoku puzzle is a fun mind game that can be played by people of all ages. Kids can color the Sudoku printouts and add a second dimension to this tradition thinking game. Printable Sudoku sheets can be shared with classmates who can provide you with hints on how to solve the puzzles. I am thinking about have a super Sudoku puzzle to print in the future. The grid would be much larger than your typical 9x9 board. My first thought is to do a 50x50 Sudoku puzzle and then upgrade it to a 100x100 grid once the 50x50 has been solved. All of the Sudoku puzzles to print include answers keys. Sudoku answers are helpful because they give you the opportunity to check your work. You can see how the puzzle was developed and what strategies could of been used to solve it. Many Sudoku tips and tricks were probably made using a strategy similar to reverse programming. This will also help you if you wanted to create your own Sudoku puzzle.